The Rabbi with a Blog (Rabbi Jason Miller): What Kind of Name is THAT for a Dog?!?!? What Kind of Name is THAT for a Dog?!?!? Josh is definitely the name of winners! 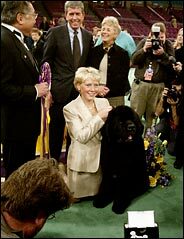 This is Josh, the second Newfoundland ever to win "best in show" at Westminster.